249 | Tak co si dnes upleteme? COTTON 100%: -a) 3 -b) 4 -c) 4 -d) 5 -e) 5 balls khaki col.
COTTON 100%: 1 ball for all sizes - turquoise col.
1st row: right side facing: * P2, K1 *, rep from * to *. COTTON 100%, using size 4 needles in Stockinette St: 22 sts and 28 rows = 4" x 4"
Using size 4 needles and col. khaki, cast on -a) 58 -b) 61 -c) 67 -d) 70 -e) 76 sts. Work in 2x1 Ribbing starting and finishing the 1st row with K1. When back measures 2" (5 cm) cont working in Stockinette St. When back measures -a) 5 1/8" (13 cm) -b) 5 7/8" (15 cm) -c) 6 3/4" (17 cm) -d) 7 1/2" (19 cm) -e) 8 1/4" (21 cm), bind off at each edge at beg of every row: -a) 5 sts 1 time -b) 4 sts 1 time -c) 5 sts 1 time -d) 4 sts 1 time -e) 5 sts 1 time. Total of -a) 48 -b) 53 -c) 57 -d) 62 -e) 66 sts rem. AT THE SAME TIME, for the neckline, when back measures -a) 9 7/8" (25 cm) -b) 11" (28 cm) -c) 12 1/4" (31 cm) -d) 13 3/8" (34 cm) -e) 14 58" (37 cm), on next right side row, bind of the -a) 22 -b) 25 -c) 27 -d) 28 -e) 30 central sts and cont working each side separately. Finish the other side the same but reverse shaping. Using size 4 needles and col. khaki, cast on -a) 32 -b) 34 -c) 36 -d) 38 -e) 40 sts. Work -a) 16 -b) 18 -c)20 -d) 19 -e) 21 sts in Stockinette St and -a), -b), -c), -d), -e) 19 sts in 2x1 Ribbing. Start the 1st row of the 2x1 Ribbing with P2 and finish with K1. When back measures 2" (5 cm) cont working all sts in Stockinette St. When right front measures -a) 5 1/8" (13 cm) -b) 5 7/8" (15 cm) -c) 6 3/4" (17 cm) -d) 7 1/2" (19 cm) -e) 8 1/4" (21 cm), bind off (cast off) at left side edge at beg of wrong side row -a) 5 sts 1 time -b) 4 sts 1 time -c) 5 sts 1 time -d) 4 sts 1 time -e) 5sts 1 time. Total of -a) 27 -b)30 -c)31 -d)34 -e) 35 sts rem. Using size 4 needles and col. khaki, cast on -a) 32 -b) 34 -c) 36 -d) 38 -e) 40 sts. 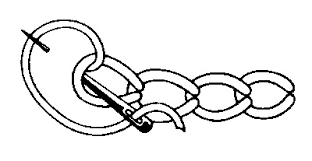 Work -a), -b), -c) 16 -d), -e) 19 sts in 2x1 Ribbing (start the 1st row of the 2y1 Ribbing with K1 and finish with P2), and -a) 16 -b) 18 -c) 20 -d) 19 -e) 21 sts in Stockinette St. 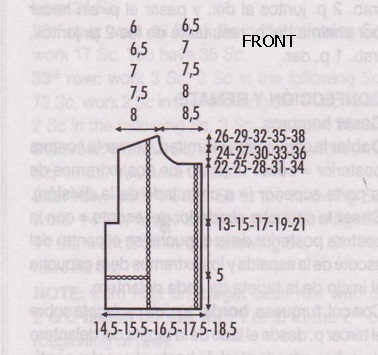 When left front measures -a) 2" (5 cm) -b) 2 3/8" (6cm) -c) 2 3/45" (7 cm) -d) 3 1/8" (8 cm) -e) 3 1/2" (9 cm), make the first buttonhole in the following manner: with right side of work facing at left side edge = when 6 sts rem until the end of the row, work: K2 tog, YO, K4. On the next wrong side row P1 in the YO of the previous row. Make 4 more buttenholes in thos manner with a distance of -a) 1 5/8" (4 cm) -b) 1 7/8" (4,5 cm) -c) 2" (5 cm) -d) 2 1/8" (5,5 cm) -e) 2 3/8" (6 cm) between buttenholes. When left front measures -a) 5 1/8" (13 cm) -b) 5 7/8" (15 cm) -c) 6 3/4" (17 cm) -d) 7 1/2" (19 cm) -e) 8 1/4" (21 cm), bind off (cast off) at right side edge at beg of wrong side row: -a) 5 sts 1 time -b) 4 sts 1 time -c) 5 sts 1 time -d) 4 sts 1 time -e) 5sts 1 time. Total of -a) 27 -b)30 -c)31 -d)34 -e) 35 sts rem. Using size 4 needles and col. khaki, cast on -a) 37 -b) 40 -c) 43 -d) 46 -e) 46 sts. Work in 2x1 Ribbing starting and finishing the 1st row of the ribbing with K1. 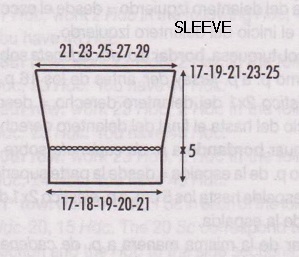 When sleeve measures -a) 6 3/4" (17 cm) -b) 7 1/2" (19 cm) -c) 8 1/4" (21 cm) -d) 9" (23 cm) -e) 9 7/8" (25 cm), bind off all sts. Make another sleeve the same. 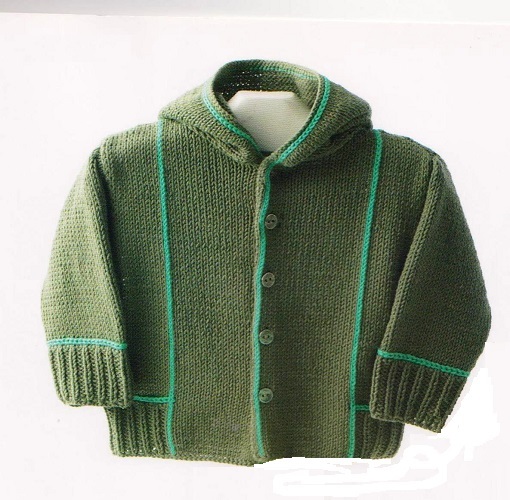 Using size 4 needles and col. khaki, cast on -a) 80 -b) 84 -c) 88 -d) 92 -e)96 sts and work in Stockinette St. 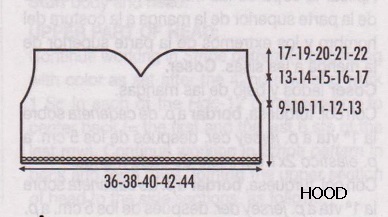 When hood measure -a) 3 3/8" (9 cm) -b) 3 3/4" (10 cm) -c) 4 1/8" (11 cm) -d) 4 3/4" (12 cm) -e) 5 1/8" (13 cm), decrease 1 st 4 times at each edge (= 1 st in from edge) on every 4th row. Work the decreases in the following manner: with right side of work facing at right side edge (= at beg of row): K1, K2 tog. At the left side edge (= when 3 sts rem on needle before end of row): sl st onto RH needle, K1, psso, K1. 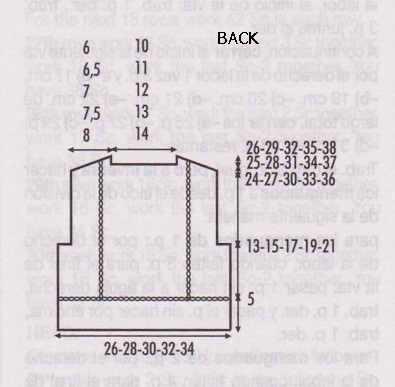 AT THE SAME TIME when hood measures -a) 5 1/8" (13 cm) -b) 5 1/2" (14 cm) -c) 5 7/8" (15 cm) -d) 6 1/4" (16 cm) -e) 6 5/8" (17 cm), divide the work into teo even parts and cont working each side separately. Decrease 1 st 4 times and 2 sts 2 times at dividing edge at the beg of every right side row. Work the decrease in the following manner: For the 1 st decreases: with right side work facing sz beg of row, K1, K2 tog. For the 2 st decreases: with right side od fork facing at beg of row, K1, K3 tog. Bind of 3 sts 1 timre at beg of tjhe next right side row and when hood measures -a) 6 34" (17 cm) -b) 7 12" (19 cm) -c) 7 7/8" (20 cm) -d) 8 1/4" (21 cm) -e) 8 58" (22 cm) bnd off rem -a) 25 -b) 27 -c) 29 -d) 31 -e) 33 sts. For the 1 st decreases: with right side of work facing when 3 sts rem before and of row: sl st onto RH needle, K1, psso, K1. For the 2 sts decreases: with rioght side of work facing when 4 stst rem before end of row: sl st onto RH needle, K2 tog, sl st made from 2 tog, K1. Fold the hood in half nd close the bck seam sew joining the two upper edges (= at each side of division). Sew the hood around tje neckline with the back seam of the hood matching tje centre back of the neckline and the edges of the edges of the hood at the sztart of the each button band at the fronts. Using col Turquoise, embroider, using Chain St, on top of the 3rd sttch from the edge of the right front button band from the start until the neckline. 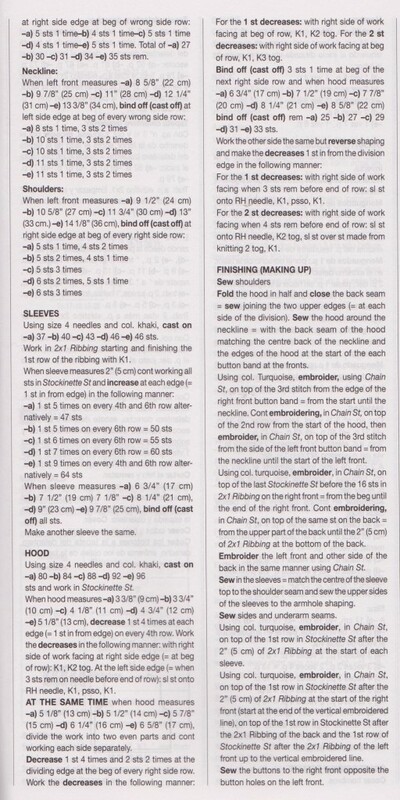 Cont embroidering, in Chain St, on top of the 2nd row from the start of the hood, then embroider, in Chain St, on top of the 3rd stitch from the side of the left front button band = from thje neckline until tje start of the left front. Using co turquoise, embroider, in Chain St., on top of tje last Stockinette St before the 16 sts in 2x1 Ribbing on the right front = fromthe beg until the end of the right front. Cont embroidering, in Chain St, on top of thesame st on the back = from the upper part of the back untill the 2" (5 cm) of 2x1 Ribbing atthe bottom of the back. Embroider the left front and other side of the back in the same manner using Chain St.
Sew in the sleeves match the centre of the sleeve top to the shoulder seam and sew the upper sides of the sleeves to the armhole shaping. Sew sides and underarm seams. Using col turquoise, embroider in Chain St on top of the 1st row in Stockinette St after the 2" (5cm) of 2x1 Ribbing at the start of each sleeve. Using col. turquoise, embroider in Chain St, on top of the 1st row in Stockinete St after the 2" (5 cm) of 2x1 Ribbing at the start of the rihgt front (start at the end of the vertical embroidered line), on top of the 1st row in Stockinette St after 2x1 Ribbing of the back and the 1st row of Stockinnette St after the 2x1 Ribbing of the left front up to the vertical embroidered line. Sew the buttons to the right front opposite the button holes on the left front.